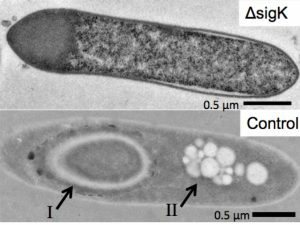 Clostridium organisms initiate sporulation in response to unfavorable environmental conditions. The sporulation process is regulated by a complex control cascade involving numerous sigma factors, proteases, and phosphatases. Clostridia contain all of the major sporulation-specific transcription and sigma factors found in Bacillus (sigE, sigF, sigG, sigH, sigK, spo0A). However, the regulation and activation-mechanisms for these transcription factors differs from Bacillus and even among other Clostridium species.